In a study presented at the Experimental Biology 2002 meeting, CLA alone was shown to cause a substantial decrease in fat mass, and for those who received CLA plus guarana, both adipocyte (fat cell) size and number were decreased by 50%. As an added benefit, sesame lignans have been shown to further increase the burning of fat by stimulating fatty acid oxidation in the liver. As with any fatty acid, CLA can be oxidized by free radicals once it has been ingested. Sesame lignans help prevent the oxidation of CLA, providing health benefits without negative impact. 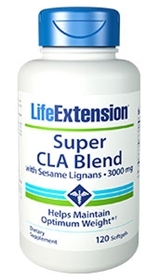 Super CLA Blend is a concentrated blend of free fatty acids derived from safflower oil. Super CLA Blend consists of 78-84% conjugated linoleic acid yielding optimal levels of its two active isomers 18:2 c9,t11 and 18:2 t10,c12, and minimizing the inactive isomers, ensuring a consistent isomer profile. Other ingredients: gelatin, glycerin, water, carob, rosemary extract. Contains sesame. This product contains NO milk, egg, peanuts, crustacean shellfish (lobster, crab, shrimp), soybeans, tree nuts, wheat, yeast, gluten, corn, or rice. Contains NO sugar, and no artificial sweeteners, flavors, colors, or preservatives. This product should not be used by individuals who have an allergy to sesame.